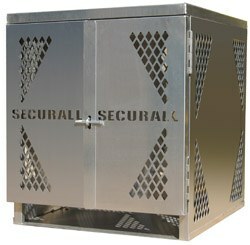 SECURALL Aluminum 4 LP Cylinder Vertical Storage Cabinets provide years of outdoor storage. These cabinets allow you to store LP cylinders vertically, complying with Canadian Standard for Liquid Propane Storage 149.2. Constructed of 12-gauge aluminum, these cabinets are resistant to sparks, corrosion and weathering. Compared to steel models, aluminum cabinets save on shipping charges.